[Note: this post dated mid-April]. 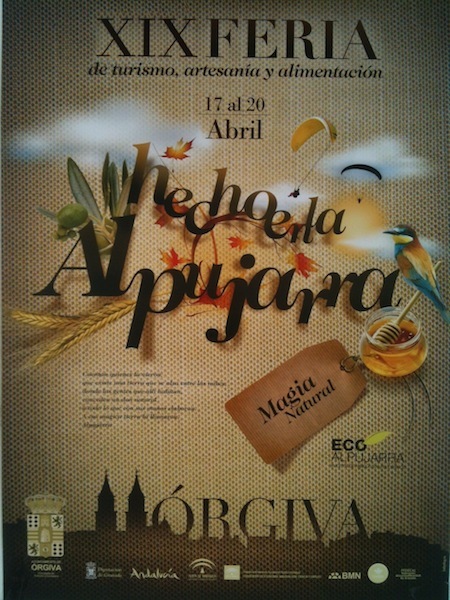 This weekend it’s the 19th annual Hecho en la Alpujarra (Made in La Alpujarra) festival. It celebrates the customs, products and crafts of the area. So, if you happen to be in town why not pop down and take a look? Much of the festival is near the Rio Chico/sports centre. There will be lots to see including 50 stands heaped with local produce – wines, hams, bread and other food (including organic produce) – as well as crafts like ceramics, jewellery and leather. More than 20,000 people are expected to enjoy the festival over the four days. You can also enjoy a series of workshops showing pottery, rug-making and weaving skills. There are tastings of yummy produce including honey, wine and organic products from producers belonging to the Asociación Alpujarra Agroecológica. And yes, you can learn how to make gazpacho! There are guided tours of Órgiva’s fabulous buildings like the church, the 16th century Ermita de San Sebastian and the ‘Don Quixote library’ as we call it. On Friday there are performances at 1pm and 5pm by the troubadours of La Alpujarra Association and La Contraviesa. One thing that caught our eye was a (free) 11km walk on Friday morning which takes in Bayacas and the newly-marked route (Ruta de los Olivos Centenarios) to the Rio Guadelfeo. For this, be at Plaza Alpujarra at 9.30am. The walk ends back in central Órgiva about noon. Whatever day(s) you visit, be sure to try out the town’s bars for a coffee or some tapa. Shops will be closed on Friday with many closing early today (like Alpujarra supermarket). We’ll be there, trying to understand the tour guides and…er….tasting the odd wine. At least she took off the life jacket. I am tasting the morcilla. But let’s see now: your 2 Thoughts or the official video? The mayoress needs your help! She just finished a stint on her other job as a BA air stewardess. Sounds like a very interesting festival, hope you all enjoy it and maybe next year I can make it. Hi Ian – sure we will – yes, try and make it next time and we can meet for a coffee! Definitely and i`ll take you up on the coffee.